"How safe is it?" I'm taking the opportunity to answer that question in detail this week. 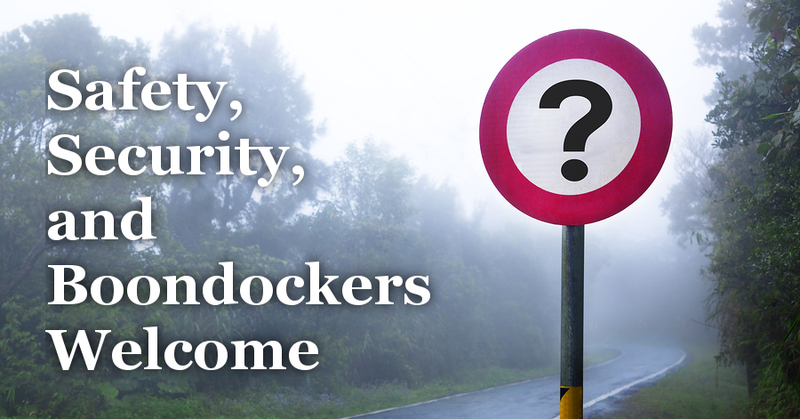 We built a number of elements into the Boondockers Welcome platform to protect members' privacy and security. Your Boondockers Welcome profile is public. Anyone can view it, not just members. Why? Would you have joined if you didn't know where our hosts are or what they offer? Prospective members need this information to determine whether our platform will suit their needs. What do we do, and what steps can you take to safeguard your identity? As a host, don't include directions, address, or photos that make your exact location obvious. The host map shows only a generalized location for each host. Exact address is revealed to a guest only once you've accepted their request. Contact us to report if a host or guest includes any identifying information in a review that you'd like removed. Limit the type of information you put on your profile, only including what's relevant. However, be sure to provide enough to give members a sense of who you are to ensure success using the site. Hosts especially want to know the reason you're traveling and stopping in their area so, if it's not on your profile, be sure to tell them in your request message. All messages between users are private. We (the administrators) can view them, however, and will do so if necessary to resolve a dispute. We will also share them with the authorities if requested. As a host, feel free to decline requests for any or no reason. Declining won't affect your response rate; it's only negatively affected if you don't respond at all. Adding any other restrictions you want to in your House Rules. e.g. ; no smokers, no children, no pop-up tent trailers, no full-time RVers who plan to work from their RV while here, etc. (All guests must confirm compliance with your house rules before they can send a request). Check ID. Real names and phone numbers are exposed to both parties once a stay request is accepted. Upon arrival, either or both parties can ask for ID to be sure the name matches the one registered on our platform. If not, you can decline the visit and report the member. Be suspicious of any request you receive by any other means than through our website. It could be from someone pretending to be a member. If the request was not forwarded from a boondockerswelcome.com address, ask them to send it through the web site or decline it. That's the only way you'll get your hosting credit, too, so you can use that as an excuse if you don't want to appear untrusting. Insist on arrivals before dark. This also allows guests time to make alternate plans in case the host needs to cancel at the last minute. If you’re unsure about using the site as a guest, it may be because you don’t trust why anyone would welcome you to park for free on their property. It may help to read this list of reasons for hosting. If you’re still on the fence about whether to offer to host, you may want to read some of the comments made by current hosts when this question was raised on our Facebook Group. I'll end with a reminder that there’s no financial risk either. A guest subscription purchase is fully refundable for 90 days if you aren't satisfied or have no luck with stay requests. There's no cost to join as a host, and you can deactivate your listing yourself at any time and instantly, should you change your mind or just want to take a break. You can also try the site out as a guest first; stay with a few other hosts before offering to host yourself. Of course, we prefer that everyone who is able to offer a host location does so - it's the whole idea of the program. But, from what we've seen, almost every member who chooses that route ends up becoming hosts themselves if they can. How could they not, after experiencing the amazing hospitality of others, and seeing how easy it is to host RVers - the most self-sufficient guests ever!